If you’re planning on showing your horse anywhere but small gymkhanas or backyard play days you’ll probably have to spend a lot of time grooming. One requirement at many shows is that your horse’s mane is thinned and braided or banded. Some horse’s necks look better with thinned manes and a thinned mane makes braiding or banding easier. For the western ring, you may wish to thin your horse’s mane slightly, without shortening it. If so, you will definitely want to thin your horse’s mane the right way, and not take any shortcuts. If your horse has a thin mane anyway, your job will be easier. If you have a horse with bushy spots in its mane, your job will take a bit longer. Thinning a mane has a practical aspect too, as your fingers and reins will always be free of the mane. Keep in mind that you may be sacrificing a bit of your horse’s comfort. The mane helps the horse swish away flies, and protect your horse from the weather, so you may want to consider this if you don’t really need to pull a mane for competition. Some breeds like Arabians, Welsh Pony and Cobs and Morgan Horses are shown with natural manes, so if you’re going in a breed competition, you’ll want to skip or minimize thinning, shortening and braiding. There are basically two ways to pull a horse’s mane: the right way and the easy way. To pull a mane the right way you will need a mane comb, scissors, and your fingers. Start by combing the mane flat. You will find it easier to pull the mane if you don’t spray any grooming spray in it, which makes the strands slipperier. For your own comfort, you might want to stand on something like a bale of hay or a mounting block, so you won’t be reaching up all the time, which is tiring. Have your horse tied in a place where he’ll be content to stand quietly for a time. You also don’t have to do the job all at once. It may be best to thin in stages, giving both you and your horse a break. You’ll want the mane to be about four inches long (10cm) long when you’re finished. This is about the easiest length to braid without struggling to grasp short hairs, or taking forever on a long mane. Trim the hair to about five or six inches long before you start pulling. You can pull a mane at its full length, but it gets tangled easier as you work. Shortening it just makes the job a bit faster. You’ll also probably want to have the horse’s bridle path trimmed. Starting at the end of the bridle path, or where the mane begins at the withers, grab a very small hank of mane and pull so that the strands come out by the roots. You won’t be able to pull more than a few strands at a time. You don’t want the mane hairs to break because this will make your braids frizzy. Pulling quickly, with a sharp snap will work better than tugging slowly. Keep working up the horse’s neck a small section at a time until the mane is shortened and is thin enough to put small neat braids in that don’t stick out from the horse’s neck, but lie flat. This process is often not comfortable for the horse or the groomer. Many horses need to be tranquilized for mane pulling. Cutting your fingers or having very sore hands as you pull individual hairs is possible too. 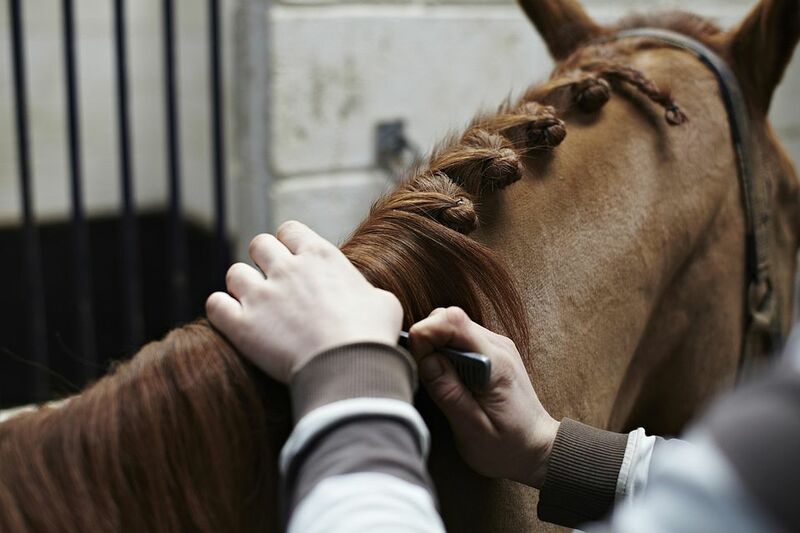 You may only want to do a few sections at a time, so your horse doesn’t have to stand for a long period of time withstanding having its mane pulled out. Some people wrap the strands of mane around a metal mane comb and yank. Depending on the horse, you may find this breaks the strands, rather than pulling them out. The easier way doesn’t yield as neat results but is much easier on the horse and the groomer. You will need to use scissors, a thinning comb, and a mane comb. You can also try thinning shears. Comb the mane smooth, and again, skip any grooming sprays. Trim the horse’s mane to about five or six inches with the scissors. You might find it easier to actually measure with a piece of twine or finger, as it’s easy to trim unevenly. Step back and view your work from a distance every so often too. Once the length is even, start making upwards cuts into the horse’s mane. This prevents the mane from looking chopped off, like a Barbie doll with lopped off hair. Don’t cut upwards too far, or you’ll get short strands that will be hard to capture into the braids, making them look frizzy. You can cut upwards with thinning shears too or pull with the thinning comb, but don’t cut more than halfway up. If your horse has a very thick area of mane in one spot like many drafts, draft crosses and ponies do, you may have to resort to manually pulling strands to thin it. You may wish to pull this small area. Or tackle it with the scissors or thinners. Be sure as you work, that you don’t go overboard and make the mane too short. It will be hard to braid, and the braids may not lie flat. Again, this ‘wrong way’ of shortening and trimming a mane doesn’t leave the mane quite as neat as the right way of ​thinning, but with practice, you’ll find a technique that works for you, and is acceptable looking once braided or banded. The only good thing about going too short is that mane, like the hair on your head does grow and in a few months, will be back at good length.